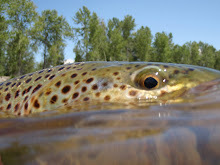 Missoula Montana offers one of the longest Dry Fly Seasons in the country! This is John Gould's Blog from Double Up Outfitters, this will be stories from a fishing guide, as well as what's new on the rivers and streams of western Montana. We'll keep you posted on hatches, river conditions and more. One more place to see videos, and fish pics from our area here. Visit our website at www.doubleupoutfitters.com for more info anytime. The "deadliest catch" & the "beach boys"
Both conditions yielded great trout, and wonderful times with our clients! Sunburn or frostbite? Pick and choose! One thing I've learned over the years is the inevitable "right of passage" that one must endure on their first skwalla trip to Montana. Apparently, if you've never been out in March or April, you must experience at least one day of casting large dry flies during a snow storm! I've been telling one of my long time clients, and good friend John, about how great it is in the spring here. He was looking at me like I had three eyes one morning as we started our float down the river in the freezing cold though. Cold temps hardly ever hit Montana in the later part of the first week of April, but since it was John's first time out here in the spring, and he had brought a companion who was also from New Mexico, the cold weather had to make an appearance for us. He did catch a 22 & 1/2 brown on the trip, and we landed many a beautiful trout each day of their trip here. I hate saying it, but they really did miss the true spring weather by one day. 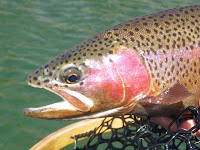 Our warmer weather hit the following day, and the dry fly fishing exploded! The right of passage continues, next year my friend, next year. What a spring it's been here. I've truly had no time for blog entries with as much guiding as I've done this spring, and the fishing continues... We are in a bit of a heat wave at the moment, and the Bitterroot has risen a little too much. The Blackfoot and the lower Clark have given us incredible fishing in the meantime, but as the weather cools this week, especially in the evenings, the Bitterroot will clear, the other rivers will follow suit, and we will be casting skwallas, March browns, and caddis galore to rising fish on the Bitterroot again in a few days! The Blackfoot and lower Clark have produced incredibly well these past few days, but the push of water is upon those two rivers at the moment now as well. The Missouri was a great river to be on today, closer to Holter where the rainbows are still plentiful, and less towards the lower Mo' where the fish have wandered off to spawn in the tributaries. Time to tie more flies right now, and dig out the orange and golden dubbing in preparations for late May and June in Montana. More to come soon, and here's to a great early summer in Montana! 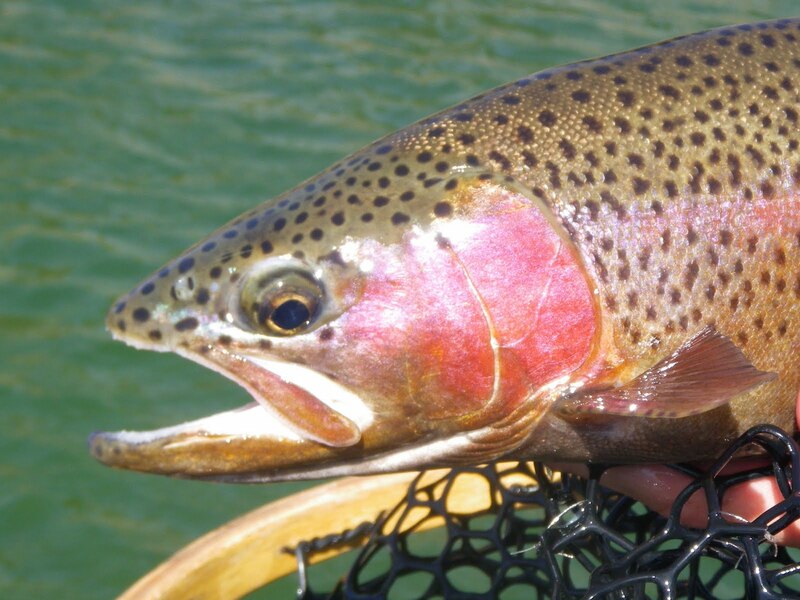 We are a full service fly fishing outfitter and guide service for all your fly fishing needs in western Montana, and more. We cater to most skilled angler and beginners alike. Either way, we are very well equipped to show you your best fly fishing experience ever. Join us in Montana for some of the best DRY FLY action on the planet, and see why this truly is "the last, best place!" John Gould here, owner, outfitter, and guide with Double Up Outfitters LLC. I've been guiding fly fishing trips here in western Montana since the early '90's. This is a family owned and operated business and we thoroughly enjoy what we do, sharing the incredible resources of Montana with our clients and friends. There is no better way to enjoy your family, friends, and in our case, our clients, than spending time fishing together. The friendships born on our rivers here are the best of the best. Thanks everyone, and looking forward to meeting more new friends, and fisher-folks this season.